The friendly crew at the Roundhouse invited us to a tasting of their Christmas menu recently. It wasn't what you'd expect in a typical Christmas menu; we usually think Turkey and Fruit Mince Pies, but the Roundhouse crew looks like they're happy to experiment a bit. We like it when people think outside the square and try something new. So we arranged a time and were off! If you decide to visit Roundhouse, do tell the Taxi driver to head towards Horsecity at 100 Turf Club Road. There is a statue of a Horse close to the entry gate to mark the spot. Our Taxi driver got a bit lost so if you end up at the Grandstand shopping mall, you've gone too far. So remember; Horsecity; and as soon as you enter via the gate/gantry, Roundhouse is to your immediate right. As it was a rainy night; we opted to sit inside. The interior was decked out with dark wood colours and the ceiling had rafters that gave it a rustic feel. The huge bar took up the center area and we were pleased to see London Pride as one of the draft Beers. We'll have one of those please! The first thing that occurred to us was that Roundhouse had a lot of great space at their disposal. You could easily fit a large crowd or hold a function here. It has good indoor/outdoor flow and we were told you can fit around 250 people at the venue. Something to note if you're looking for a good catering or function space. Whilst we were waiting for the tasting to start, our host for the evening had a chat with us. All of the staff at Roundhouse were extremely nice and friendly. Quick with a smile or a little joke. We liked this a lot as it wasn't pretentious or uptight. It helps us to relax when the staff are approachable and there to offer good service. It was then time to start the tasting. 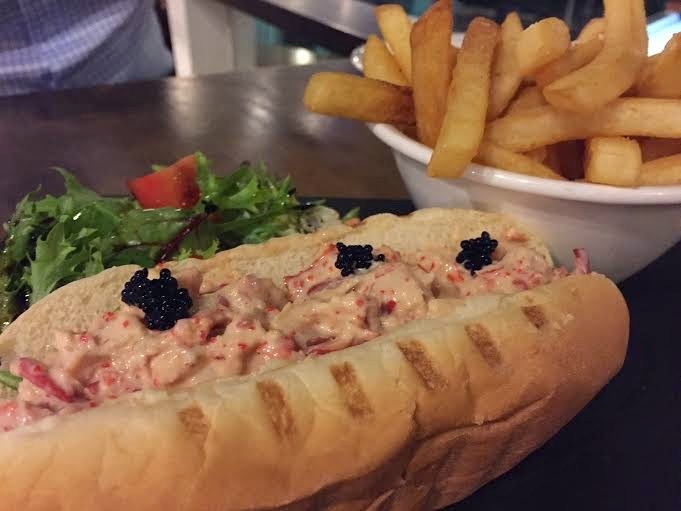 The first dish was the Sweet Red Chilli Lobster Remoulade Roll. This was served with a side of Salad and Fries. The Lobster was done nicely and didn't have that overcooked rubbery texture to it. The meat had a nice sweetness to it and was firm to the bite, that kind of "crispiness" when the produce is fresh. We were told that these were Canadian Lobsters. The Remoulade sauce was creamy and was quite mild; we were expecting more of the sweet chilli hit with it, we do love a bit of spice. The Remoulade wasn't too chilled as well; it was at a nice room temperature, so you didn't end up eating something that felt like it was straight out of the fridge. It was tasty and went well with the Lobster. The Fries were piping hot and the Salad with a simple dressing rounded it off nicely. For the next round; we had the Roasted Spring Chicken, with Sage stuffing, served with baked Rosemary Potatoes and crispy Bacon. The Chicken is from France and was very juicy. When you cut into it, the cooked juices would flow out and cover the Rosemary Potatoes. The Potatoes were nice and crispy and the Bacon was super nice; you just can't argue against Bacon. The Sage stuffing was a highlight. It was able to soak in a lot of the moisture from the roasting process as well so it captured a lot of the flavour from the Chicken. It certainly helped that the Sage Stuffing was stuffed under the Chicken skin; this was a surprise as it wasn't stuffed the traditional way. This was awesome. And if the Chicken wasn't juicy enough; there was a serving of Chicken Jus on the side to fulfill your gravy fantasies. Our final course was Dessert. There is always room for Dessert! When we saw the Winter Log Cake, we knew it was Christmas time. It was the most festive looking dish of the night with the very distinctive Christmas Colours. The Winter Log Cake is a White Chocolate Yogurt and Raspberry Semifreddo with Red Berries Financier and Raspberry Coulis. The Semifreddo was amazingly good, a very soft fluffy texture and not too sweet. It was like a fine indulgent Mousse. The Raspberry center made it a bit more tangy to round off the taste combination and the combination of the yogurt gave a hint of sourness to it. Love at first bite scenario here. The glaze on the Log was amazing too and helped to hold it together. It was like a thin layer of Sugar Syrup. The Financier was crumbed and used as a base for the Log. The Raspberry Sorbet rounded off the Dessert by adding a bit more "tanginess" to the subtle sweetness of the White Chocolate in the Winter Log. We thought that the Dessert was a perfect way of rounding off the meal. The rest of the evening we spent chilling out with a few more drinks and talking to Chef Miguel. We talked about the dishes he created for the Christmas menu and of course, where to get wonderful food around Singapore. What else would you talk about with a Chef? :) We also had a good conversation about Tapas as he is from Spain and it was great sharing great eating spots around Singapore. We swapped info on a few places. He shared with us some exciting plans that were being drawn up; due to happen at Roundhouse in the upcoming new year, apparently a new look is on the cards for the restaurant and Chef Miguel will be designing a new menu to mark the transformation. It'll be great to see how the plans have come together when we pay a visit next year. Roundhouse is a place with a very friendly team who are always smiling and happy to have a chat with their customers. Chef Miguel is quite new; only about 2 months, so brings along big plans for the future and some of his talents show through in the Christmas menu which we tasted. The flavours are definitely there and the food is good at Roundhouse. It is simple and tasty and doesn't try to be something it isn't. Given how Chef is new, we're looking forward to seeing what other magic he can work in the kitchen and if more unique creations will start appearing on the menu. The Christmas menu is available from now until the 28th of December. If you like what you see; go ahead and check it out. Thank you to Roundhouse for the kind invitation!